Abnormal Duck Wing : What to do and How to Prevent it. An abnormal duck wing, such as angel wing, twisted wing, and lazy wing occur in waterfowl populations that are fed by humans. Not a lot of research has been undertaken on the syndrome. Abnormal duck wing occurrences do not affect the ducks ability to carry out normal duck production or activities such as eating, foraging, drinking and swimming. Angel Wing usually only occurs in one wing. 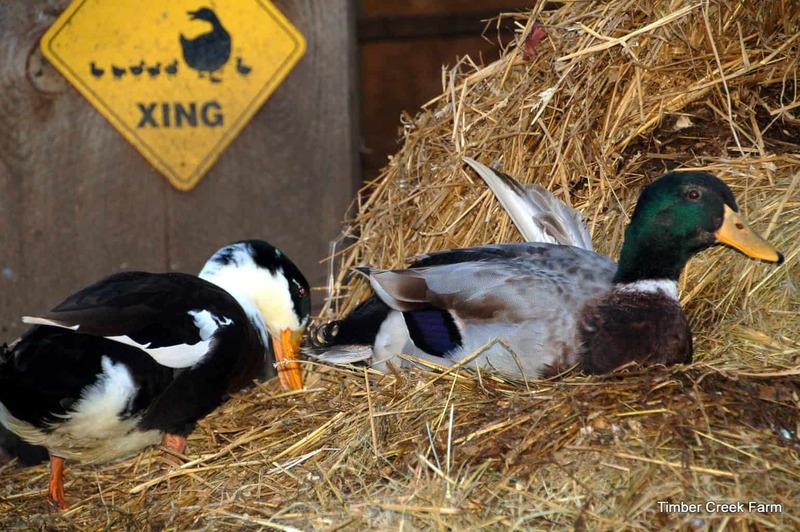 The condition merely affects the appearance when discussing ducks and other waterfowl kept in a backyard farming setting. However the underlying reason why this happens is cause for concern and is easily remedied. British researcher, Janet Kear, from the Wildlife Trust in Great Britain, investigated the syndrome and noted that in wild waterfowl populations, wing disorders were non-existent or extremely rare. This led her to conclude that the previous belief that the abnormal wings were a genetic trait was not the whole story. Abnormal duck wing occurrence was rare in populations that were not fed commercial diet or scraps of human food, particularly bread. (Metzer Farms) Kear determined that the cause of abnormal wings was inappropriate or inadequate amounts of protein, vitamins and minerals. Specifically, feeding a commercial diet that is more than 16% protein past two weeks of age may increase the incidence of these wing disorders. 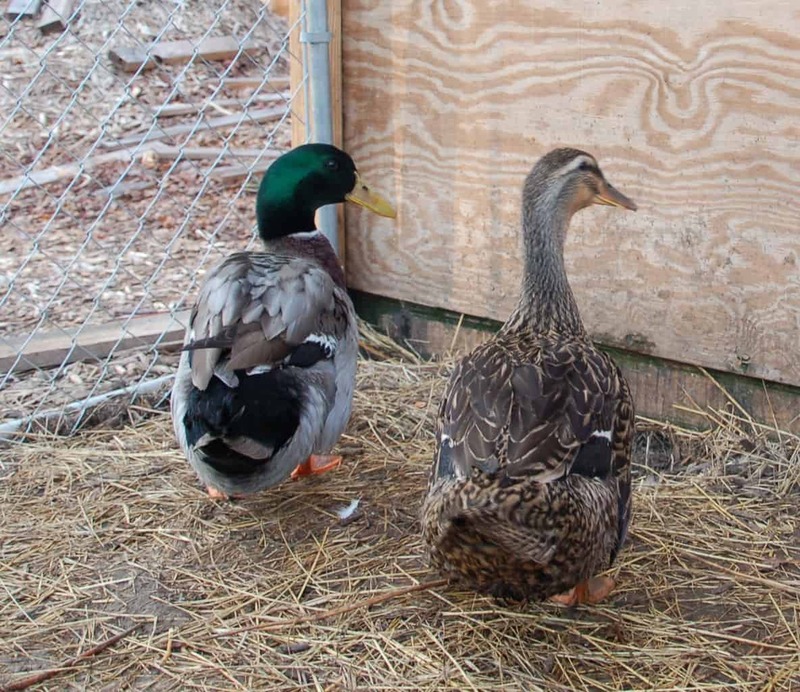 Dave Holderread, author of Storey’s Guide to Raising Ducks, also lists an higher than necessary brooder temperature as a potential cause. Holderread recommends using an 18% protein feed for only the first two weeks of growth, followed by a 15% to 16% protein feed up to ten weeks. The wing bones and most growth has been reached by 16 weeks of age. Both Kear and Holderread conclude that feeding an unlimited diet of high energy feed, such as a turkey grower ration, results in unnaturally fast growth. This accelerated growth causes the twisting of the lower wing bones as they develop because the weight of the bones is heavier than the wing structure can hold, at the time. The result is a twist and a wing that sticks out from the body. Research has also shown that when the condition is caught early, switching to a diet of alfalfa pellets, instead of a chick grower ration, can halt and reverse the condition. Wild waterfowl that are never fed by humans show no evidence of wing disorders. 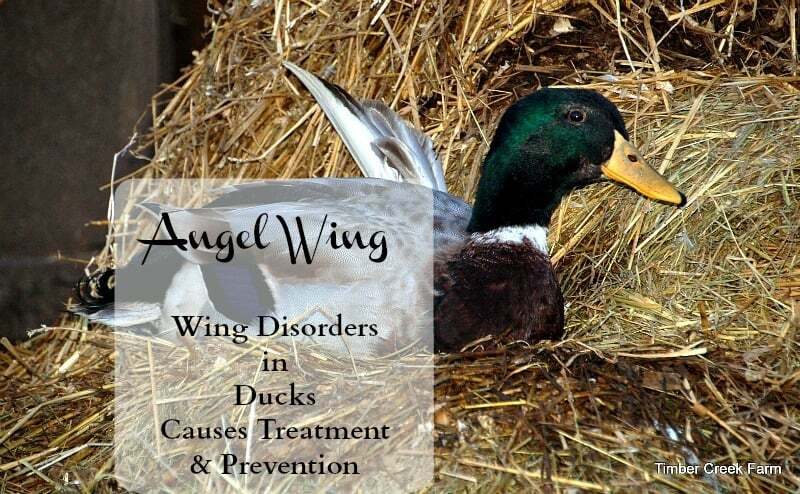 Ducks raised domestically and allowed to forage and free range when conditions are safe to do so, will rarely exhibit any sign of wing disorders. Caught early, before the wing bones have hardened, treatment of angel wing may be repaired. Manually correcting the positioning of the wing and taping it in place for 10 to 12 days, can correct the wing position. I would recommend vet wrap, because it is easy to work with and won’t stick to the feathers and downy underbelly. I found some nice clear pictures of how a duck should be wrapped here, Caroline Crocker Originals If the appearance of angel wing in a mature duck bothers you, it is possible to reduce the appearance somewhat by carefully trimming the flight feathers. Personally, if the duck is getting along well and eating and being part of the flock, I would just leave it alone. In addition to limiting the protein level exercise is also a key factor in proper development of the wings and the entire bird. Access to plenty of greens, exercise and swimming may reduce the occurrence. One of our drakes has a rather pronounced case of angel wing. I did not know what was happening at the time I noticed it developing and concluded that it was a genetic issue. So I did not do anything to correct it. He gets along just fine and is a large, capable boy. But when we raise the next batch of ducklings, I will be more aware of what they are eating and only use the starter ration for the first couple of weeks. 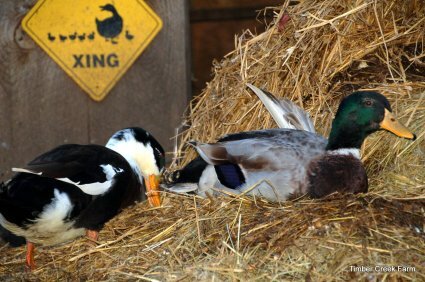 Domestic ducks kept in a backyard setting with safe housing probably will not see any ill effects from a twisted wing. This is not the case however when talking about wild ducks, or large populations of free ranging ducks raised on a farm. In the case of wing deformities, the duck will not be able to fly away from a predator. With wild ducks and waterfowl, the affected bird would not be able to fly away from winter weather conditions and would be left to survive in extreme conditions, instead of flying south for the winter. One Green Planet.org wrote that “Feeding white bread to wild birds is killing them”. This might be a bit of a dramatic statement, but in essence it is true. Feeding high protein and high carbohydrate/sugar foods such as white bread and crackers can lead to wing deformity. This can then leave the bird as sitting prey for a predator or automobile to injure of kill. When permissible, stick to the following items when taking treats to ducks and geese. Great post! I’ve read the same advice and make sure that our ducks mostly get leafy greens as treats and plenty of exercise very early on. Although mine would also revolt if I told them no more mealworms! There would be rioting in the streets of the farm. Well there’s no streets but I am sure they would block the driveway! What great information. Thanks so much for sharing at Simple Lives Thursday; hope to see you again this week. This was a great informational post. We do have ducks here on our farm and want to add more in the future. 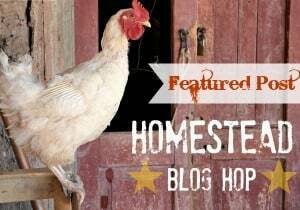 This will be a featured post on Homestead Blog Hop. Hope to see you Wednesday! Don’t forget peas! They’re duck crack. I live in Bloomfield, NJ and a large pond in front of my home! 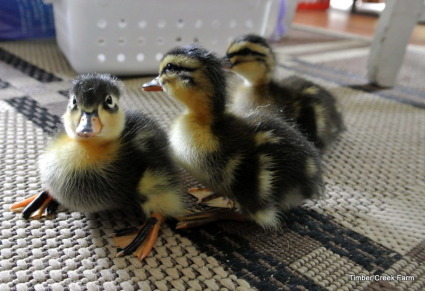 A little over three months ago a female duck gave birth to some ducklings. One duckling now has an injured wing and can’t seem to fly off like its siblings. I am just wondering if anyone can suggest a facility that might come and take the duckling and nurse it back to health? Thank you in advance for any help you can give me! I have a 7 week old American Buff gander (bought through Metzer Farms) that keeps having to pull in his wings. They are not turned out like angel wing, but you can tell that they’re heavy for him. He can airplane around the yard no problem. Is this something that will resolve itself by limiting protein and allowing plenty of free roaming and exercise, or should I consider taping them up until his little muscles can handle the weight? We have a 4 month old Muscovy that has the same problem with her wings. They are close to her body but continually fall like they are too heavy. She is constantly trying to pull them back up. Like someone with loose pants, in need of a belt, keep pulling them up because they keep slipping down. Did you ever get your question answered or come up with a resolution? 1) I have a pet Muscovy duck. She just laid her first clutch of eggs and finished laying them about a week ago. She laid one a day for a total of 13 on this first clutch. Almost immediately after finishing laying the last egg… she has very little appetite and barely eats. Is this normal? It has been a week or so later and still is only eating prob less than 1/4 of the amount she used to. Also what type of food would you recommend that I should be feeding her? 2) My duck has angel wings. I took her to the vet, but the dr advised me her bones were already developed and she was too old to solve the problem by taping them. My question is .. Can I clip/ trim the feathers on the wings that are sticking out? Just make them shorter.. Lately she has been getting them caught on things. I know they have blood feathers.. But I don’t know which ones they are or how to trim the feathers sticking out without causing her any injury or damage. I’m afraid if I don’t trim them she may injur or break her wings if she keeps getting them caught on things. Also, is there any other solution besides surgury? Please advise! Any information would be helpful and greatly appreciated. Sam, thank you for your comment. I hope your hen is still sitting. Yes they do eat considerably less than normal when broody. I encourage our hens to leave the nest. They don’t always want to and will act aggressive but once they go out they usually eat something, take a quick swim and eliminate waste. I also put food and water near the nest. She can continue to eat the regular ration you feed, pellets are the best for ducks. As far as the angel wing, you can trim the wing but I don’t know what to tell you about how far. There is a blood supply and you need to avoid trimming too far and hitting that portion. Someone who can actually see the wings would be better able to help you answer that question. Good luck and I hope you find some healthy ducklings one day.